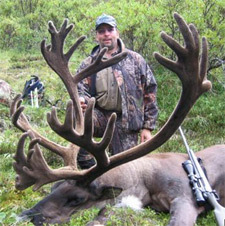 Yukon Stone Outfitters offers some of the very best Mountain Caribou hunting in the industry. These hunts are conducted 1x1 in accordance with the Yukon law for all big game hunting. We offer horseback or backpack trips depending on your preference and these spot and stalk hunts can be done also by boat as a couple of our lakes get frequent visits by large bulls on the shore. Unlike several other species of Caribou, Mountain Caribou are more resident and therefore do not migrate in herds of hundreds or thousands. As such, you will be hunting smaller groups of 20-40 during the rut, and often times individual bulls, if it is in the early season. 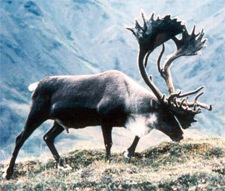 The caribou herds in the Pelly Mountains have long been described and thought of as the largest genetically of the Mountain Caribou. In fact, the number one Boone & Crockett world-record Mountain Caribou was harvested in our hunting concession in 1988 and has a net score of almost 460 inches! The genetics here are some of the best anywhere. We consistently kill bulls scoring between 360 and 390, and also shoot bulls in the 400+ class every year. We generally start to hunt the caribou after the first week of September when the horns are hard at that time and they start to bunch up as they come down off the high mountain ridges. We continue to hunt them into the first week of October when you can really see their full white mains and white stripe sides on the mature bulls. 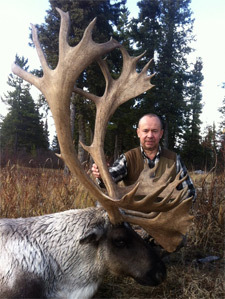 Since the season opens on August 1, we also hunt caribou early for those who are looking for a bull with short, dark hair and antlers in full velvet. At this time the Caribou are in groups of 3-5 and are often high up on ridges with the sheep to keep a cool breeze on their antlers and the insects off their bodies. On these early hunts, be ready to hike and you will see Stone Sheep because they are at the same elevation this time of year. With all the different ways we have to chase these magnificent creatures, we can put together the right trip for whatever experience you desire.